Tailor-made for hard-working power on the jobsite, the 2019 Toyota Tundra is a true workhorse in the Toyota model lineup and a fan favorite at Downeast Toyota. 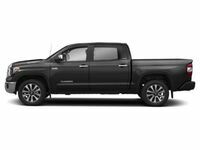 Armed with a rugged, body-on-frame design, an arsenal of power-packed V-8 engines and a wealth of innovative features, the 2019 Toyota Tundra near Bangor, ME is the total package. When you opt for the power-packed 2019 Toyota Tundra, you will have a choice of six trim levels – SR, SR5, Limited, Platinum, 1794 Edition and the trail-rated TRD Pro – that will start at just $31,420. 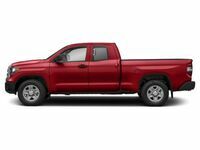 Toyota Tundra entries are available in three body styles – Regular Cab, Double Cab and CrewMax Cab – that can be paired with a 6.5-foot standard bed, an 8.1-foot long bed or a 5.5-foot short bed. With rear-wheel and four-wheel drive entries, the Toyota Tundra can be tailored to fit your lifestyle. Drivers who choose the 2019 Toyota Tundra near Bangor, ME are no strangers to pure horsepower and torque that translate to incredible towing power and horsepower-driven adventures. Entry-level Toyota Tundra editions feature a 310-horsepower 4.6-liter i-Force V-8 that manufactures 327 pound-feet of torque. Married to the standard six-speed automatic transmission, the 4.6-liter engine will earn 19 mpg on the highway. An available 381-horsepower 5.7-liter i-Force makes 401 pound-feet of torque and is married to a six-speed automatic transmission to deliver even more power. When it comes to hard work at home, on the jobsite or on the farm, the 2019 Toyota Tundra will check all the boxes. With a maximum towing capacity that stands at 10,200 pounds and a maximum payload of 1,730 pounds, the Toyota Tundra has the power you need to get the job done. Work hard, play hard is a phrase that Tundra owners are familiar with when you equip the 4WDemand part-time four-wheel drive system that gets an upgrade with Active Traction Control and an Automatic Limited-Slip Differential. Inside the 2019 Toyota Tundra cabin, you will find yourself surrounded by a wealth of standard, high-end features. Base Toyota Tundra models come standard with 18-inch steel wheels, an integrated trailer brake controller, a rearview camera, Toyota Safety Sense™ collision-prevention systems and a 6.1-inch Toyota Entune™ touchscreen infotainment system with Bluetooth. Upgrades to the Toyota Tundra spec sheet include a 7-inch Entune™ touchscreen display, premium leather upholstery, a navigation system, heated and cooled front seats, a 12-speaker JBL® sound system and much more. Visit Downeast Toyota today to get behind the wheel of the 2019 Toyota Tundra!